Charming stone villa set in huge grounds with a large private swimming pool, commanding panoramic views of the countryside. 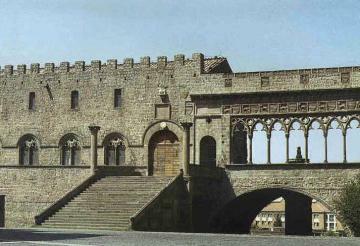 Located 8km from the Lac de Vico and 20km from Viterbo and Perugia. Rome airport 80km. Orvieto 45km. Beach at Tarquina 50km. Restaurant and shop 2km. Supermarket 8km. The upper floor (accessible by the exterior stairs only) has a double bedroom (1 x 160cm wide bed) with en-suite shower room and a large terrace with panoramic views. The ground floor has a living and dining room with television, DVD player, and hi-fi. Open-plan, fully equipped kitchen with oven, coffee maker, kettle, microwave, dishwasher, washing machine etc. High chair for a baby. Double bedroom (1 x 160cm wide bed) with en-suite shower room. Overall this villa is comfortable, the décor is neutral and tasteful. Internet access. There is a large covered terrace for outdoor dining and relaxing, along with a barbeque. The superb pool is exceptionally large for a villa of this size and is complemented by a pergola which offers shelter from the sun. The grounds are full of beautiful olive and hazelnut trees. There is room to park several cars. Being nicely secluded this villa is ideal for honeymoons. Refundable cash deposit €400 payable locally. Heating for the house and firewood. Additional services (where available) including cleaning, babysitting and cooking.